Surgical removal of a small number of BHD skin lesions has been reported to work in some cases. However, there can be scarring and there is no guarantee that this solution is permanent. Curettage uses a curette (a sharp spoon-shaped surgical implement) to remove skin lesions. Cautery uses a heated electrode to destroy skin tissue. 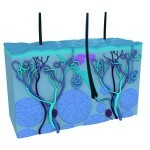 This technique can also destroy normal tissue near to the skin lesions being treated and can cause scarring. Cold cautery, or cryosurgery, is like cautery but uses extreme cold to freeze the lesion instead. This treatment has minimal pain and scarring; however, there is a risk of nerve damage to surrounding healthy tissue. Electrocautery, fulguration, electrodessication, electrosection and hyfrecation are all types of radiofrequency ablation. Radiofrequency treatments use a probe to deliver an electric current directly to target tissues, which rapidly heats and destroys them. An electrode is used to treat the surface of the skin, and is often used for skin resurfacing or tightening in cosmetic procedures. Radiofrequency ablation causes fewer side effects than cautery. Hyfrecation has been reported to successfully treat a BHD patient’s fibrofolliculmas with no recurrence 2 years after treatment. Combined curettage and hyfrecation has been reported to treat a BHD patients’ fibrofolliculomas with minimal recurrence 3 years after treatment. Cryoablation is a freezing technique similar to cold cautery where cold electrodes are used to freeze and destroy tissue. The treatment is very precise and leaves less scarring than traditional surgery. The cold deadens tiny nerve endings so there may be less pain as well. Both radiofrequency ablation and cryoablation have also been used successfully to treat kidney tumours (see kidney treatment).